Gonzo's Quest is a 20 line poker machine with cascading wins, increasing multipliers and a free spins feature where wins can be multiplied by up to X15 and wins can be as high as 187,500 credits. 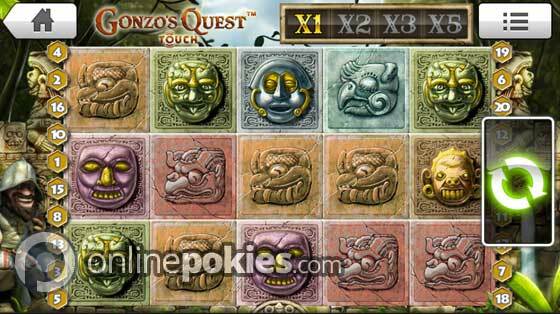 Gonzo's Quest - The Search for Eldorado is a 20 line pokie game with cascading reels and free spins. It offers multipliers on both the base game and the free spins with the highest multiplier being X5 on the regular spins and X15 on the free games. The game comes in a range of credit sizes that start at 1c and you can choose to bet between 1 and 5 credits per line. The lowest bet is 20 cents and the highest is $50 per spin. Gonzo's Quest has an Avalanche feature that means you have cascading wins. The way this works is that on any spin the wins are paid and then the winning symbols are removed and new symbols drop into play. For each consecutive cascade the win multiplier increases by one level. On the base game the multipliers are X1, X2, X3 and X5. If you reach the highest multiplier any further cascade wins on that spin are all multiplied by X5. One of the great things about the cascade feature is that you can get a lot of wins for a single paid spin. The Question Mark symbol is wild for all symbols including the Free Falls bonus symbol which only appears on the first three reels. To win the free games on Gonzo's Quest you need to get three or the Free Fall symbols on an active line aligned left to right. You win 10 free falls for each of the winning lines the Free Fall symbols appear on so you can win multiple sets of 10 games with a single bonus trigger. On the free games the cascade multipliers are increased to X3, X6, X9 and X15. This means you have the chance of winning up to 187,500 credits if you hit the highest winning combination on the highest multiplier. Additional free falls can be won during the feature by getting three or more of the free fall symbols on an active line.